I had plans for a bit more color on this card but when I got this far I stopped because this card just made me smile! That doesn't always happen but when it does I know the card is finished! I paired Daffodil Delight with the new color Gray Granite - love it! Uncle was the catcher on his Little League Team. When he got older the Big Guy enrolled him in a one week summer baseball camp to prepare him for middle school sports. The camp was an hour away and I was the designated driver. (Hooray for nearby malls and early movie times!) So every day for two hours I listened to Uncle whine and complain how he didn't want to go and he wasn't going to do anything once he got there and he would rather be at the lake and he was going to sit on the bench and refuse to play because it was too hot and on and on and on. On the last day parents were invited to a short awards program. The final award was given to the player who had shown the most enthusiasm, energy and improvement during the week......and Uncle won! The prize? A "full scholarship" to the next year's summer camp.......still makes me laugh thinking about the look on his face when he won that prize! I love Jen Brum's criss cross sketch this week! Have fun with it at Freshly Made Sketches! What a beautiful card! Perfect way to use that sketch, love the clean design! And your story about baseball camp totally cracks me up!! What an awesome "gift" he received for sure! Ha! I can see clearly, now... it's gonna take a LOT of strength to resist buying another gray ink! This is totally the best 'wake up' story, too, Linda! thanks for the laugh! and this beautiful start to my day! What a super-unique sketch and a wonderful way to approach it. 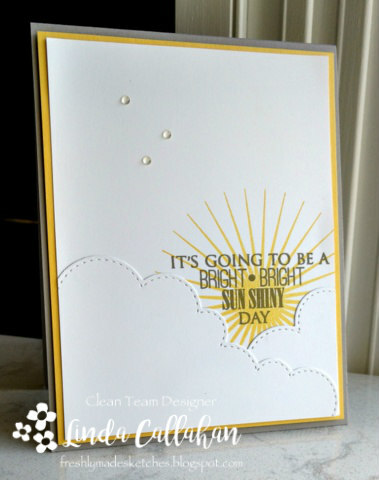 Love this sunshiney card, Linda! I love how you've used the clouds with this sketch! This card makes me smile too. As does your funny story. I just love your stories Linda. And the way you have of coming up with such different cards. I thought I was not going to like that gray, but you have showed me why it can be a great new color. The card is so cute...I think I am singing that song now...but bad Uncle's story made me laugh out loud!!! I will need to think of some bad Mommy stories to tell Cassidy, LOL! Linda I just LOVE this card! So simple but what a message! Love it ... in fact you know I'll probably CASE this one! So CAS... love the white space and the colors are perfect! Just like your baseball camper!!! So cute. Hugs. Everything about your design is perfect, Linda! Fabulous take on the sketch! Your pretty card gave me smile and the bad Uncle story made me chuckle...two things I needed! This is such a great card Linda! I just love those clouds and the sun burst! The Grey Granite is a fabulous colour! I do love yellow and grey together! The Bad Uncle story is the best!!! I can only imagine what the Baby Baby stories are like!!! This is such a sun-shiny happy card. And now I've got that song running around in my head! What a great take on the sketch! And poor Uncle. Loving and hating baseball all at the same time! Now you have me singing this song..... Love this take on the sketch. The clouds are brilliant! That story is hilarious!! Oh my...Miss Emma will remember to tell that back to her uncle, lol! Oh I love this! 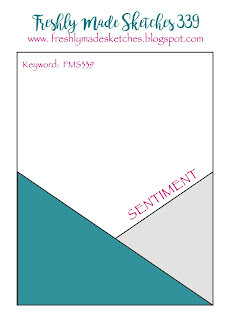 You are so creative - those clouds and the placement of your sentiment are perfect! This is an amazing card - I am in awe! I love everything about it!